I am a person that is very easily influenced by what I saw on the television. I remembered when I was to attend a conference in Brisbane, I had a throng of endless nights to think 'what if I couldn't understand what they will be saying in their slang?'. But then, it ended very well as the nervousness and anticipation made me prepared well (too well at times). And then when people mentioned about having steak, I will always imagine having dress up and dining in a fine restaurant, using the beautiful china and all. But since I want to indulge in the steak wholeheartedly (because steak is pricey), I wish that I don't have to dress up, just roll up my sleeves and dive in, using my hands and no fancy utensils, at all! And now, I have that freedom to dress as simply as I want and eat the steak using my fingers and not fancy utensils! I have found this uniquely named eatery, by the roadside, nonetheless, aptly called 'Stiq' [pronounced as steak] - pun intended! Looking like a food truck, but without tires, this stiqhouse is situated in Wangsa Maju, by the roadside, under a tree, with only tents and flip tables and chair ready! And when I arrived, there was already a long queue, either waiting to be seated or waiting for their takeaways. Looking at the setting, I thought to myself 'The price better not be causing me an arm!'. And then, bam! The price list was right in front of my face! 'I hope the taste is as good as the price too.' Skeptical much, Rawlins? About an hour and a half later, after been served 7 of the best sellers, I am sold! Stiq serves the best steak at very affordable prices in town! I proclaimed so because the meat was juicy and tender. I realised that I do not have any slabs of meat stuck in my teeth after the meal was done, unlike when I ate overly priced steak at some posh eatery. WHAT IS SOUSVIDE? 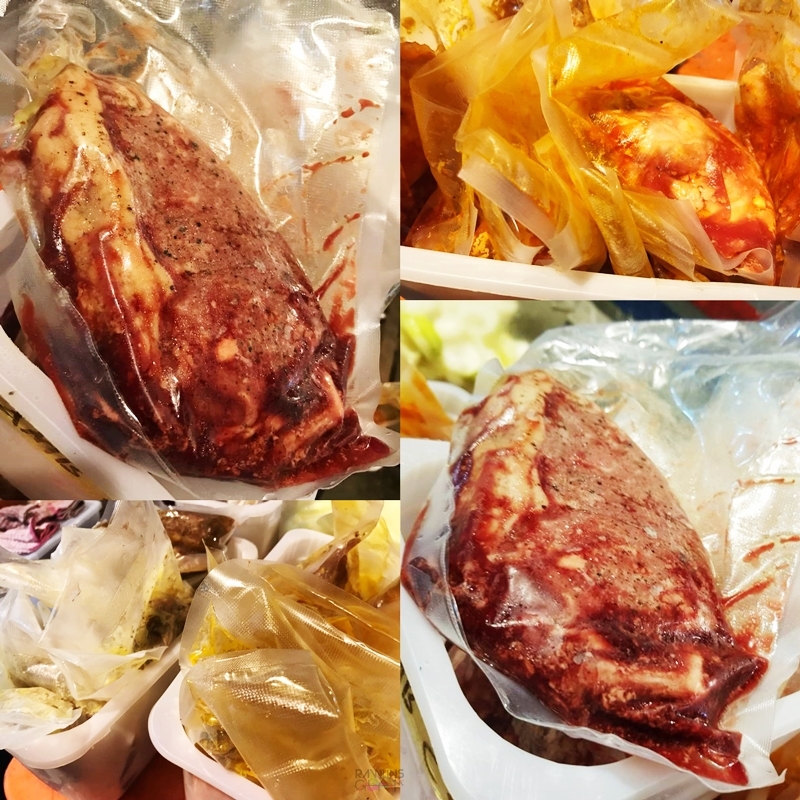 Sous-vide (/suːˈviːd/; French for "under vacuum") is a method of cooking in which food is vacuum-sealed in a plastic pouch or a glass jar and then placed in a water bath or steam environment for longer than normal cooking times (usually 1 to 7 hours, up to 48 or more in some cases) at an accurately regulated temperature. The temperature is much lower than normally used for cooking, typically around 55 to 60 °C (131 to 140 °F) for meat, higher for vegetables. The intent is to cook the item evenly, ensuring that the inside is properly cooked without overcooking the outside, and to retain moisture. No wonder the meat tasted like a piece of heaven inside my mouth, and I savoured the meat longer before eating it through (an action that I do not normally do as I eat fast). 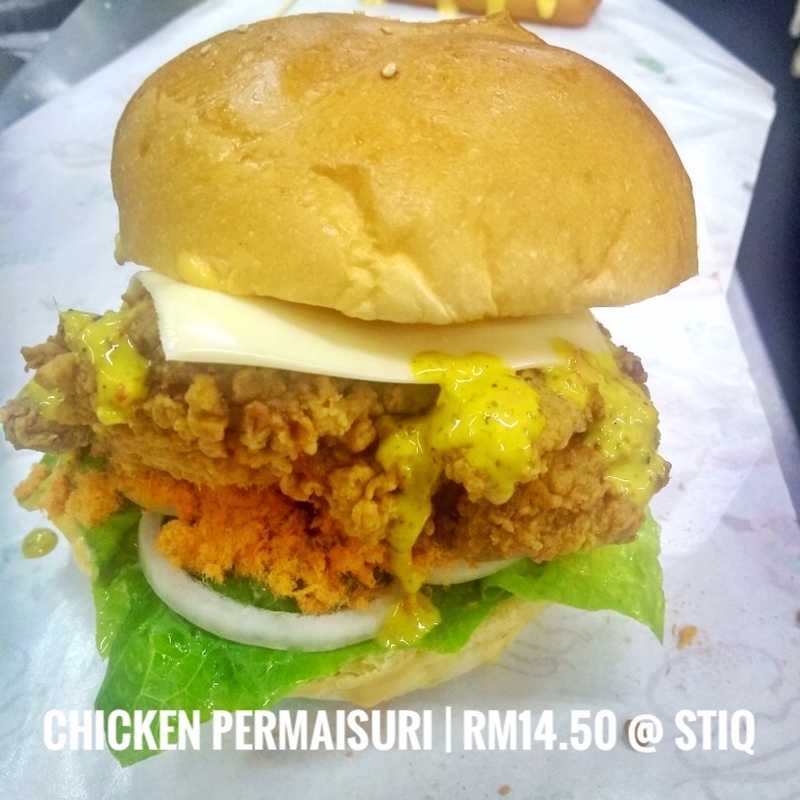 In operation since October 2017, Stiq has been the talk of the town due to its premium meat, tasty dishes and also reasonable and affordable price (they are selling up to 40% under the market price). When I asked about whether they can make a profit by selling at such a price, the Big Boss just smiled and answered 'InsyaAllah, even worm could still survive while living under the rock. But we also believe in numbers - more customers equal to bigger profit.' And I do believe that they are getting bigger numbers as people keep on queuing while we were munching away on the dishes. So people, let us see the best sellers from Stiq that I tried. Each menu comes with one drink (can/ bottle). And Stiq is using US potato, strips of bacon and sour cream as the garnish for each menu too. Whereas, each steak is weighing 250 - 300 gm each. As for the sauces, we can request for the sauce as per stated in the menu above. Which one is the winning dish? As for me (and I'm being biased as I love meat and chicken haha), the Grass Fed Striploin tasted the best, that night! As we were about to leave the table, the Big Boss of Stiq came and presented two of the best sellers burgers from Kaw Kaw Burger, the burger stall next to his joint. 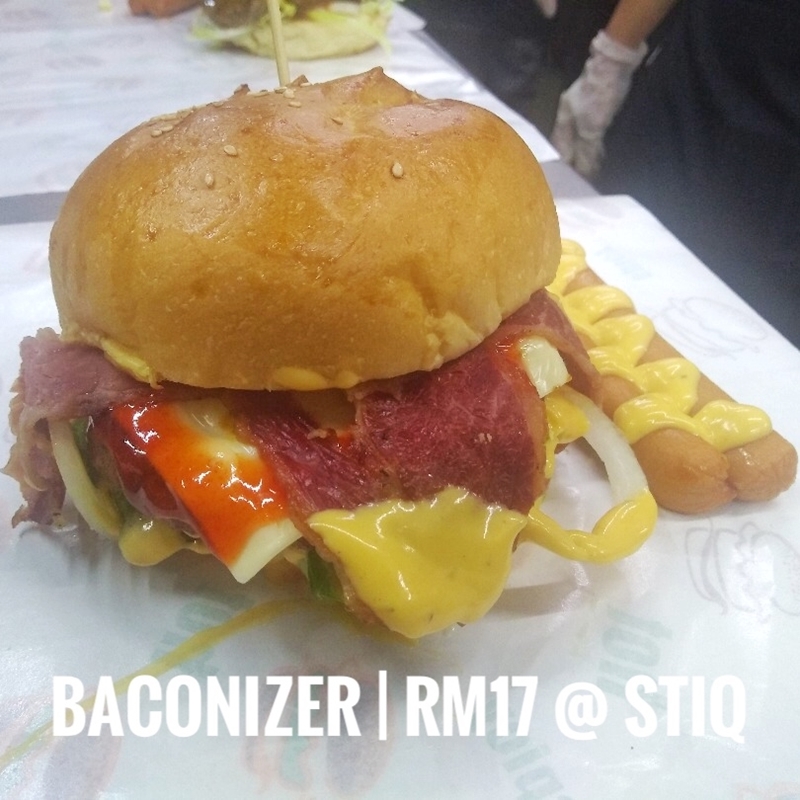 'Your trip to Wangsa Maju eateries is not complete without tasting these two delicious burgers' he said. True enough, despite we were all full, the burgers were done in just minutes and we found ourselves licking the sauces from our fingers. I will definitely come again soon. I wanna try the wagyu from Stiq. or for people with map-disability like me, use Waze and just type in Stiq Wangsa Maju. ya tuhan, semua nampak sedap! kena cuba lahhh ni kalau sampai sana. warghhh dekat dah Wangsa Maju dengan Sal , seriously makanan semua nampak sedap ... nyummmyliciouss...nak ajak Mr Hubby ! Sedapnya, tak ajak pun pegi makan Stik. Btw, comelnya kedai dia. Nanti nak terjah sinilah makan-makan. Nampak sedap betul stik tu. Rasa macam nak ulang balik makan kat sini hari tu tak berapa puas sekrang ni dah ok boleh bedal semua sekali tapi tak adalah orang belanja hehehehehehe..
Oh my goodness!!! Those foods looks delicious and really tempting. and it makes me feel so hungry. That beef stiq tease me. Oh my, my mouth-watering right now. Next time g KL nak pergi terjah dekat stiqlah! Wow you do seem to enjoy your food... takpe la badan kecik huhu makan bnyk pun tak gemuk... untungnya.. When i see these foods, all i think is "add more glass of wine please!" Coz this could be a perfect dining experience. Thanks for the heads-up! I have not been there before. Look so yummy I want to try too. wah.. menu2 dasyat semuanya.. lamb shank tu dengan kambing lambak paling tb nak try. nampak sedap je..
best of the best steak.. i miss all the meat there. ><"
Nampak sedap sangatlah.. Nak try dan makan sana lah..
Dekat sangat dah dengan rumah ni. Boleh lah try makan dekat sini. Tengok harga Semua boleh tahan dengan portion yg dia bg. Include drink too. Ok sgt tu. Nampak sedap weyhh. Ggrrr asyik nampak gambar makanan je harini. Western food stail Malaysian lebih sedap walau dimana2. Stir ni dekat dengan rumah. Nnti nak cuba. Harga not bad. Hungry now when reading your post. Sukalah dengan konsep dia. Menu dengan harga pun not bad dengan portion banyak. Sedap tak Rawlins? Bestnya 😱😱😱😱 showing this to my husbad & he said "Jom! Kita dapat apa-apa achievement dalam life kita, kita pi sana celebrate". Haha.. Hope worth it. Nampak sedap sangat! 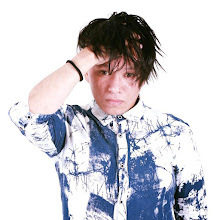 PERGH! Nampak sedap gila. Would love to try it out one of these days. Lets hope and see when i'll be around the area. dapat la rasa!